Droughts and water restrictions are as common in Florida as mosquitoes and humidity. Just a couple of the inconveniences of living in a tropical paradise. But if not planned properly, your landscape may face devastating consequences, especially as we enter an extended dry season. Below we will explore how to create a drought-tolerant landscape, and how to nurse your existing landscape through watering restrictions. Mow your grass high, with a sharp mower blade – keeping the grass high allows the root structure to grow deeper and stronger, and the sharp blade lessens stress on the grass. Water early, uniformly, and the right amount – water only on your allotted days, and typically around 0.5 – 0.75 inches of water, but never until the water begins to run off your lawn. Uniform watering will prevent spot problems like overgrowth or dry patches. Watering early in the morning allows the water to absorb before it evaporates in the heat of the day. Halt or reduce fertilizer and herbicide/pesticide applications – fertilizer, herbicide, and pesticide can stress your lawn. Postponing them or reducing the frequency will help your lawn better manage the stress of the drought. Moving beyond your lawn, you should establish priorities for which plants need water more than others, and ensure they are watered more frequently, by hand if allowed and necessary. 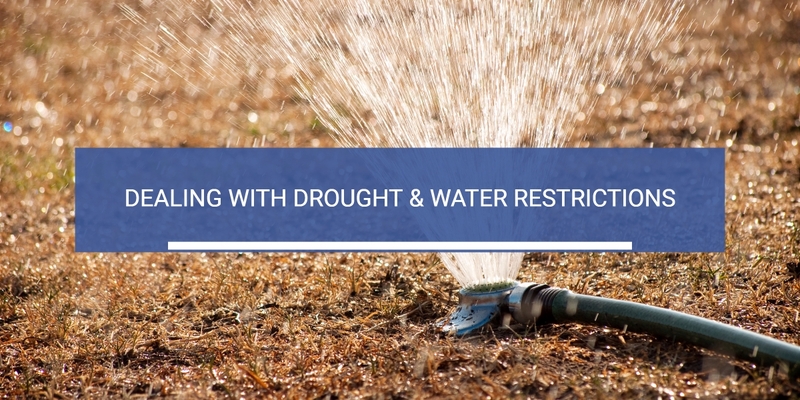 Additionally, newly-installed landscaping is often free of watering restrictions for a certain amount of time, but always check with local regulations before watering. Follow a pattern similar to the lawn guidelines when it comes to any chemical applications and watering. Finally, make sure you have sufficient mulch (3 inches deep) to help insulate, retain moisture, and minimize weed growth. As we mentioned above, selecting a drought-tolerant turfgrass is an important first step. However, replacing your grass is typically the least expensive part of your landscape. For some, replacing grass with a hardscape, xeriscape, or other groundcover is a preferable option. This certainly makes for less mowing! But it’s not totally maintenance-free – weeds will still grow, leaves will still accumulate, and you will need to replenish your ground cover. You also want to make sure the plants you’ve selected will thrive in Florida’s climate changes – from cool and dry to hot and humid. Working with a landscape professional will certainly help ensure that you’ll get the right plants. If you’re doing it on your own, choose native plants over imported ones, and plants from climates similar to ours. Four plant selections from the University of Florida’s Institute for Food and Agricultural Science are the Saw Palmetto, Acacia Tree, Jerusalem thorn tree, and Rosemary. The Saw Palmetto is a native Florida species and the other three, while not native, are attractive and very drought-resistant. Drought, or at least a dry season, is a guarantee in Florida. Taking steps now to plan, or planning your landscape with this in mind, will prevent problems (and watering citations) once the dry season comes. Picking the right plants, watering properly, and taking care of your landscaping the right way will go a long way toward keeping your yard looking beautiful regardless of the weather.